There are very few television shows that have thrust the viewer into the fray with the sheer force and unnerving energy with which HBO's powerful drama, OZ, does on a weekly basis. By offering a closer look at life in jail, series creator Tom Fontana effectively serves up a grittier—and more frightening—version of Scared Straight. In short, Oz is a television show that breaks free of the restraints thrust upon by commercial television and may well be the reason that HBO is leading the way in groundbreaking dramatic television today. The story, set inside Oswald State Penitentiary, deals with a small area of the large prison nicknamed "The Emerald City," an experimental wing where the environment of the normal prison system is thrown out the window. Emerald City replaces bars with glass panes and offers a commons area where the prisoners can spend their time at their own leisurely pace. Inmates are afforded access to computers and cable television with the only catch: they must undergo routine psychological and drug tests. The plot deals with a large number of inmates, each of whom control a very different aspect of the Emerald City. There is Tim McManus (Kinney), the father figure who received a gunshot wound in the riots that closed season one. The only problem is that the shot may have been fired by a guard. This is all important to Leo (Hudson), the warden who sees corruption on a daily basis, in both the prisoners and his guards. As for the prisoners, they are broken up into several factions, the first of which is the Aryan brotherhood. Led by Schillinger (Simmons), this group may be responsible for shooting McManus. Simon Adebisi (Adewale Akinnuoye-Agbaje) leads the Homeboys and is in solitary confinement and out of action following the riots. There are also the Muslims and the Italians, each of whom are working one side against another. Among the other key factors in The Emerald City is Ryan O'Reily (Winters) a psychopath who killed at will in the free world. There's Beecher (Tergesen), a model citizen on the outside but deadly inside, and finally, you can add the first female inmate as well as some diseases and murders that will slowly trim down the population in The Emerald City. Anchored by uniformly flawless performances and direction OZ comes to DVD in its second season in a lovely three disc set that chronicles the ups and downs of yet another time span spent inside the wonderful world that is OZ. After a riot that killed six inmates and two officers, Oz is closed off to prisoners and guards. The prisoners are sent to general population, while a select few end up in solitary confinement. Much to the dismay of Governor Devlin (Zeljko Ivanek), a special committee is appointed to investigate the riot and his use of force and response. The committee is headed by Alvah Case (Charles S. Dutton), a law school dean who weaves his way through the inmates and staff at Oz is search of answers, the most elusive of which is whether McManus was shot by a guard of a prisoner. A nice way to begin the season, but I was left wanting a bit more; we will have to wait until later episodes, it seems. This one receives 4 out of 5 handcuffs. With the dust settling from the riot, Emerald City is reopened to the prisoners with a healed McManus at the forefront of finding out just what went wrong. He also establishes a more human side for the unit, which includes education for those without high school diplomas. O'Reily learns he may be in the beginning stages of breast cancer and Schillinger is offered the chance for a parole hearing, but not if Beecher (Tergesen) has anything to say about it. Meanwhile, Leo's daughter is raped by a gang of Latino's, leaving the warden to take his aggression out on a Latino inmate named Alvarez (Acevado). This is what the series should be like, 4.5 out of 5 handcuffs. Things are shaping up in the land of Oz as several plots are created in this episode. Alvarez is withholding the information about who raped Leo's daughter, while O'Reily undergoes an operation to attempt to stop his breast cancer. Upset with their position in the food chain, the Aryans plot to have a rival killed while planning to execute Beecher as well. Series narrator Augustus Hill (Perrineau) goes up for appeal after it is discovered that the judge for his trial was accepting bribes. Finally, a female inmate enters the fold much to the delight of numerous inmates. The show is on a roll with another 4.5 handcuff episode. Hill loses his appeal as the title states but there is so much more going on in this episode. O'Reily survives the procedure and is given another chance at life much to his delight as he falls in love with his doctor (Lauren Velaz). Alvarez is offered a piece of a lucrative drug business if he kills Adebisi, who has a better offer for Alvarez. A powerful episode this one rates a full five handcuffs. Adebisi retaliates against Schibetta (Eddie Malavarca) for an attempt on his life by poisoning him, but with diminished results. The diploma program is cut due to budgetary concerns in the Governor's office. Beecher learns that his wife has committed suicide, while O'Reily is so infatuated with Dr. Nathan that he plots to have her husband killed by his brother Cyril. A first rate episode that shows signs that things are coming to a head. This one rates 4.5 handcuffs. O'Reily: What do you know about love? McManus: I know I wouldn't kill for it. O'Reily: Well then you've never really been in love. Schillinger is making plans to get out of the Emerald City before someone ends his time for him. Schibetta is viscously assaulted after his recovery from the attempt on his life. Meanwhile, a new inmate, Jiggy Walker (L.L. Cool J) arrives, proclaiming to be the one-time drug dealer for the Governor. Finally, Dr. Nathan confronts O'Reily about her husband's death. A slow but intriguing episode bogged down by a useless appearance by Cool J, this one rates only 4 handcuffs. O'Reily lands his brother in Oz after the murder of Dr. Nathan's husband and he is immediately attacked by the Aryans. A former Catholic priest prepares to leave after serving his time, while Beecher falls into drinking again after the death of his wife. Adebisi sees his time shorten, perhaps for good, after a new gang leader vows revenge for his attacks on Schibetta. Everything is leading up to the powerful conclusion, making this a 5 handcuff episode. With the help of an Aryan guard, Schilinger and friends are given the chance to escape through a tunnel being built by two other inmates. The Catholic priest returns to prison after discovering he is unable to deal with the outside, and Beecher learns of a shocking betrayal by a fellow inmate. Finally, Alvarez attempts to regain his previous stature by attacking a guard, but the consequences are serious. A very powerful finale. The final episode for Season 2 rates a full five handcuffs. Image Transfer Review: Presented in full-frame transfers, each of the eight episodes looks exactly as they did when I viewed them on satellite television several years ago, which is to say they look just fine. There is a hint of haze and grain throughout, but it appears that this is intentional as each episode has the exact same issue. Colors are nicely rendered with no bleeding, while the black levels are rich and deep. The transfer is free from any type of edge enhancement or pixilation. Audio Transfer Review: The Dolby Digital 5.1 mix is largely active throughout as it offers a rich recreation of the prison atmosphere. The surround speakers are used often for music or background sounds including ambient and directional effects. Dialogue is crisp and clear throughout, with no dropouts, while the .1 LFE track offers some nice low-end support. Extras Review: The third disc houses the majority of extra features and while I wish there had been more, what is offered is certainly worthy of praise. First is a short featurette on the making of the show that runs a quick four minutes. You do not really learn anything new about the show, but it is nice to see the actors and creators speaking so passionately about the show. Most notable in terms of extra material is a visit to the National Museum of Television and Radio by creator Tom Fontana and other members of the cast and crew. Fontana does a terrific job of describing the creation of the show, while the directors and actors discuss what it takes to produce it and keep the high level of quality. This is most definitely worth a look. Rounding out the three-disc set are episode previews for each installment, as well as cast and crew biographies. 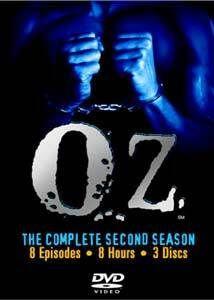 For even the most casual fan, Oz: Season Two is a "must have" for your collection.